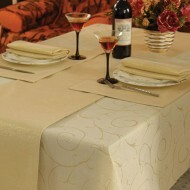 Plain Napkins 17" x 17". Pack of 2. Silver.. Plain Placemats 13" x 19". Pack of 2. Silver.. Plain Table Runner 13" x 85". Silver..